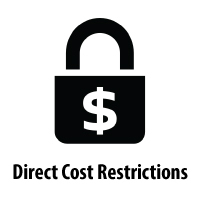 Federal Regulations restrict the charging of certain administrative expenses as direct costs to grants and contracts unless specifically identified in the proposal and approved in the awarding document. Clerical and Administrative Salaries Use the Account Range below for these salaries. Office Supplies It is not allowable to purchase office supplies on the Lab and Technical Supplies accounts (62600-62644). The Operational Supplies accounts should not be used on contracts and grants (62400-62443). Local Telephone Costs Telephone equipment, fax equipment, telephone installation and repairs, and cellular phones are unallowable. Individual long distance phone calls pertaining to the project are allowable. Postage The expense associated with sending letters through the USPS is a postage charge. The expense of sending express packages is a Shipping/Freight charge. If any of the restricted categories listed above need to be charged to an award, the following restricted accounts must be established on the award by the Office of Sponsored Projects before incurring any charges.